Badly damaged during the Civil War, Edgbaston Church was largely rebuilt in 1721 by the new lord of the manor, Sir Richard Gough. As the population of this wealthy district grew, the church was enlarged at least five times during the 19th century. 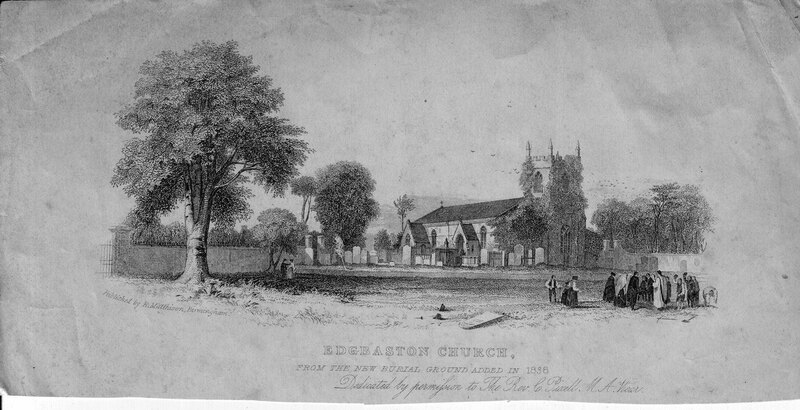 Find the website of Edgbaston Old Church at - http://www.edgbastonoldchurch.org.uk/. 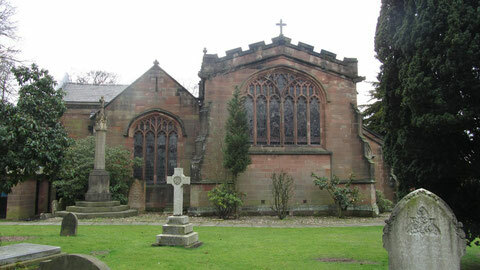 See also A Church near You - http://www.achurchnearyou.com/edgbaston-st-bartholomew-old-church/. 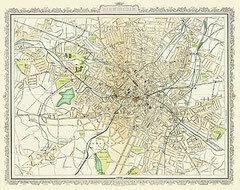 A History of Birmingham Places & Placenames . . . from A to Y Edgbaston - http://billdargue.jimdo.com/placenames-gazetteer-a-to-y/places-e/edgbaston/. Map from “The Royal Atlas of England and Wales” by J.G.Bartholomew for George Newnes Ltd 1898. Image courtesy of the Mapseeker website - http://www.mapseeker.co.uk/ - use permitted for non-commercial purposes. Edgbaston Church was originally a chapel of St Peter’s Harborne. 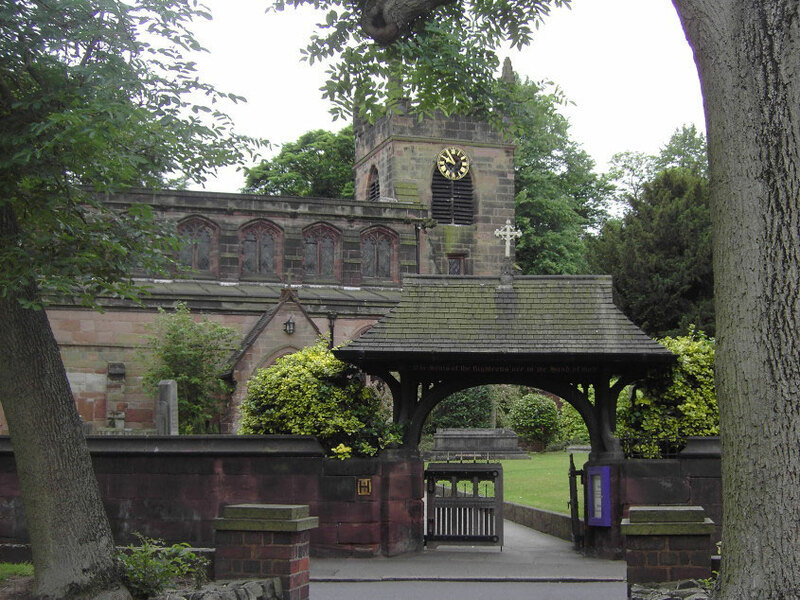 First mentioned in 1279 in a legal dispute, it may be assumed to have been fairly recently built as it is not mentioned in earlier disputes about Harborne. In the 13th century Harborne is referred to as the mother church. The nave is 14th-century and stands on the site of the first building here. There can be, however, little 14th-century work left, as the nave has been expanded by the addition of aisles on each side. A north aisle and arcade were built in the late 15th century were paid for by lord of the manor, Richard Middlemore. The tower of c1500 paid for by his wife Margerie. The lower half of the tower is now the oldest surviving part of the building. Their son, Humphrey, became a Carthusian monk and was martyred in 1535 during the Henry VIII's persecution of Roman Catholics. Stained glass in the west window of the south arcade is a modern depiction of this. 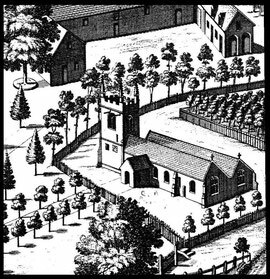 Henry Beighton's drawing of Edgbaston church in William Dugdale 1730 Antiquities of Warwickshire. At this time the nave and north aisle had separate pitched roofs. Although Edgbaston church was still referred to as a chapel in 1535, it was probably effectively independent of Harborne by this time and by 1658 it is described as the parish church. The advowson belonged to the dean and chapter of Lichfield until about 1725, when it was granted to Sir Richard Gough, lord of Edgbaston manor, in consideration of his repairing the church and endowing the living. 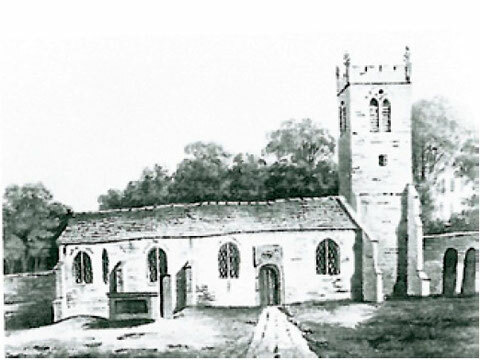 The church building had been severely damaged during the Civil War 1658-1684 when both hall and church were occupied by Parliamentary troops. The roof lead was melted for bullets, while the roof timbers and stone were used to barricade Edgbaston Hall. Ten years after the Restoration of the Monarchy, local people began to rebuild the ruined church at their own expense but were unable to finish it. In 1683 they were granted King's Letters Patent to request charitable donations from church collections in Warwickshire, Northamptonshire, Oxfordshire, Gloucestershire, Worcestershire, Leicestershire and Shropshire. Donations must have been forthcoming because the restoration of the church was subsequently completed. 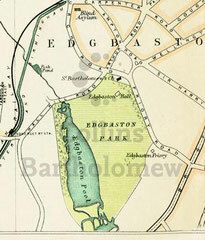 In 1725 Sir Richard Gough of Perry Hall bought Edgbaston Hall and its estate. He had the church restored at his own expense. 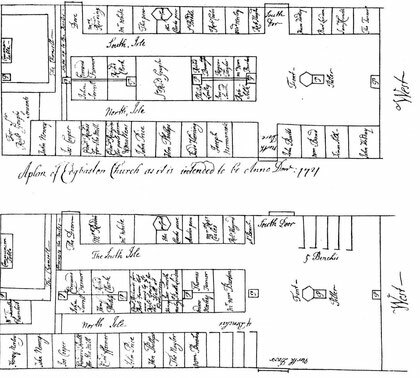 Plans of the church of 1721 show the arrangement of seating before and the proposed changes to the interior: Before 1721 there were a few free seats on benches at the back of the church. After Gough’s reorganisation his large box pew took pride of place and there were no free seats at all. 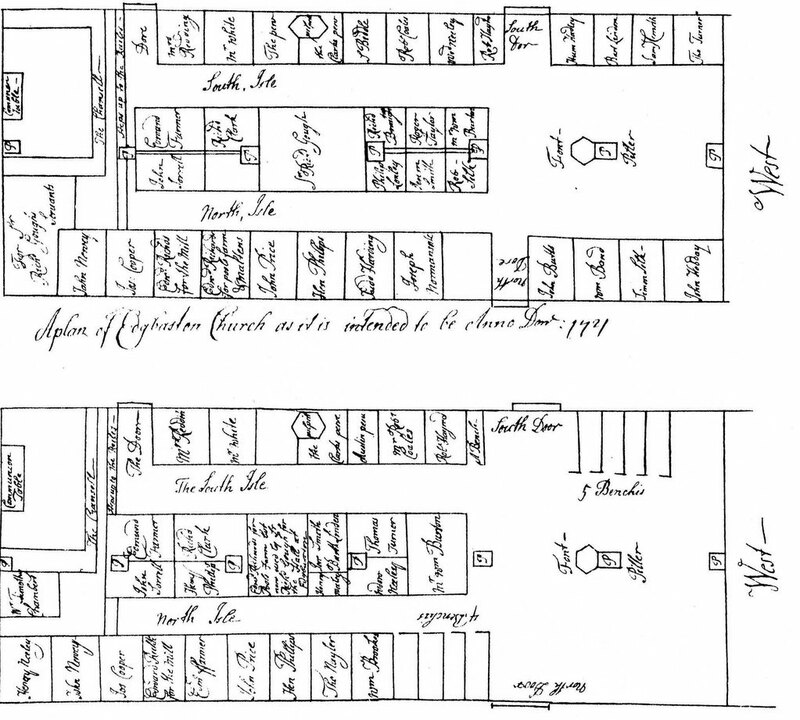 The diagram of 1721 above shows the arrangement of seats in the church before (lower diagram) and after (upper) Richard Gough's reorganisation of the interior of the church. As the new lord of the manor, Gough's own large pew was placed directly in front of the pulpit. The five free seats and standing room at the west end of the church disappeared and all seats have now been appropriated ie. have to be paid for. In 1810 the nave and north aisle were given a single low-pitched roof in a major restoration when the interior was almost totally rebuilt. In 1845 the roof was raised by two metres to allow for galleries to accommodate more of the gradually increasing population of Edgbaston. 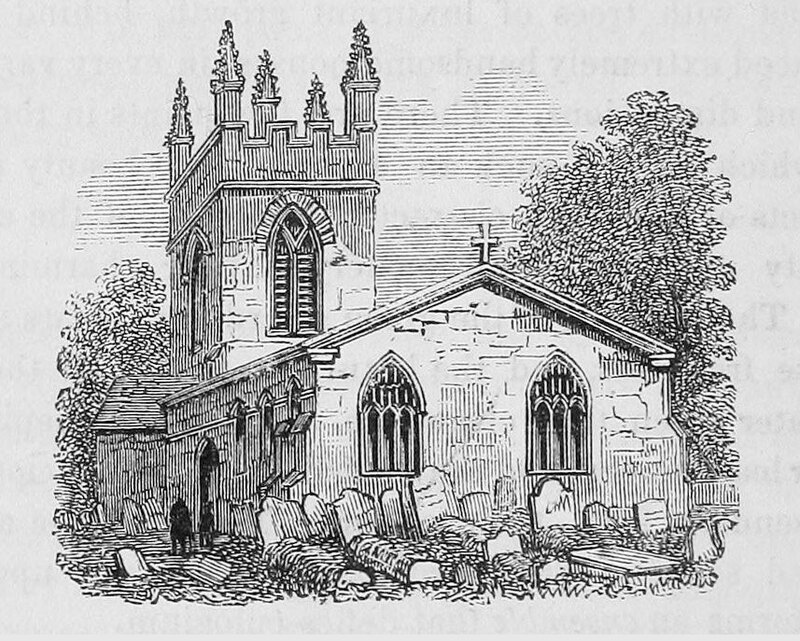 Above: Edgbaston Church in 1810 viewed from the south. As the population continued to grow, new churches were built in the parish: St George's 1838, St James's 1852, St Augustine's 1868 and St Mary & St Ambrose in 1903. In 1856 J A Chatwin built a south aisle, and in 1885 a new chancel paid for by Middlemore descendants, brothers William, James and Richard Middlemore. The present chapels were built, the nave widened, the clerestory raised and new more steeply pitched roofs were built. In 1889 a second south aisle was made as the wealthy population of the district continued to grow. Apart from late-15th-century work in the north and west walls of the north aisle and nave and the early-16th-century lower part of the tower, the church now is practically all Chatwin's work, in an accurate representation of 14th-century gothic. It is a Grade II Listed building. There are monuments here in memory of the Gough-Calthorpes, the current manorial family, and a notable wall monument by William Hollins which depicts a snake twisted round a stick and foxglove. This commemorates William Withering, the discoverer of digitalis. A bust also by Hollins of Jean Marie de Lys, is a memorial to the founder of the Deaf & Dumb Institute. In the churchyard is the tombstone of J A Chatwin 1830-1907 who not only carried out extensive work on this building, but on many local churches old and new. There were two bells here in 1552, four bells by Matthew Bagley in 1685, five in 1781 and six in 1898. All six were recast in 1927 with two new bells added. This ground-floor ring is the home tower of the Birmingham University Society of Change Ringers. 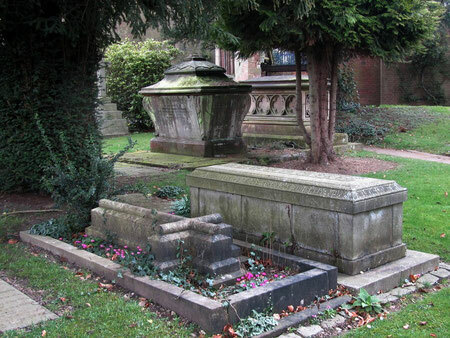 Chatwin's tomb is the second from the front. 777 - This plaque is in the north porch above the door. It may be a misreading of the letter M for Middlemore which was found after the destruction of the Civil War and then wrongly recarved during the subsequent restoration. Information about the church can be found in a planning application for a property adjacent to the church - http://eplanning.birmingham.gov.uk/Northgate/DocumentExplorer/documentstream/documentstream.aspx?name=public:0901487a80f8d9ad.pdf+0901487a80f8d9ad&unique=562107&type=eplprod_DC_PLANAPP.